﻿ Beats Biblionetz - Texte: Is pair programming more effective than other forms of collaboration for young students? Is pair programming more effective than other forms of collaboration for young students? Pair-Programming führt gemäss dieser Studie zu ähnlich guten Lernerfolgen wie andere kooperative Lernformen aber dafür sind die Lernenden weniger von Informatik begeistert (evtl. weil sie in ihrem Flow gebremst werden). This study compared two highly collaborative learning environments to isolate aspects of pair programming that are influential for supporting students’ understanding, attitudes and interest in computer science, and pace. There were no statistically significant differences between students’ performance on daily quizzes; however, there was greater variation in performance on daily quizzes for students using pair programming. There were no statistically significant differences between students’ responses to attitudinal survey questions; however, students who used pair programming were slightly less positive for survey questions related to interest in computer science. Students who worked on their own computers completed exercises more quickly, but it was not feasible to validate if the quality of students’ work was similar between the two treatments. This study investigates differences between collaboration methods in two summer enrichment classes for students entering the sixth grade. In one treatment, students used pair programming. In the other treatment, students engaged in frequent collaboration, but worked ontheir own computer. Students in the two treatments did not differ significantly in their performance on daily quizzes or responses to attitudinal survey questions. However, the students who worked on their own computer completed exercises more quickly than those using pair programming. 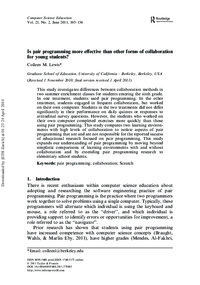 This study compares two learning environments with high levels of collaboration to isolate aspects of pair programming that are and are not responsible for the reported success of educational research focused on pair programming. This study expands our understanding of pair programming by moving beyond simplistic comparisons of learning environments with and without collaboration and by extending pair programming research to elementary school students.